What are Wooden Masks used for? Local theatrical dramas are often acted out with special costumes and masks. The stories are told time and again and usually involve the triumph of good over evil. They may be enacted in the hope of a good harvest or clement weather. The spirits of the mountains and forests must be appeased for the village to prosper. 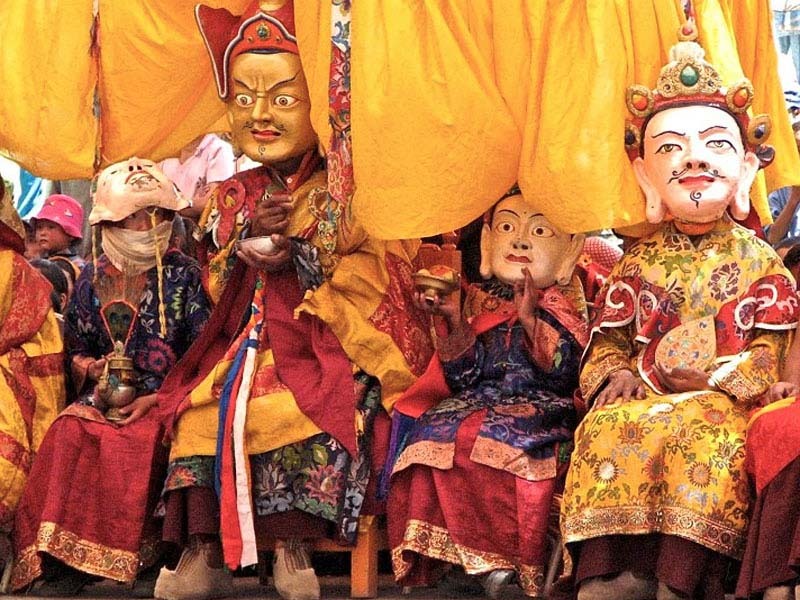 The masks below are being used in the Cham dance, or masked dance festivals at monasteries in the Buddhist region of Ladakh in northern India, the first is at Phyang and the second is at Tak Tok during a Padmasambhava initiation ceremony. When not in use, carved wooden masks may be hung above the hearth and acquire a smokey patina or they may be stored in a chest until the next time. In Tibet and northern India the masks are often hung from the ceiling, locked away in a special room because they have such powers that they shouldn't be seen casually, with preparation or context. The images below are of a Tibetan "devil" mask and a grinning Nepalese mask.